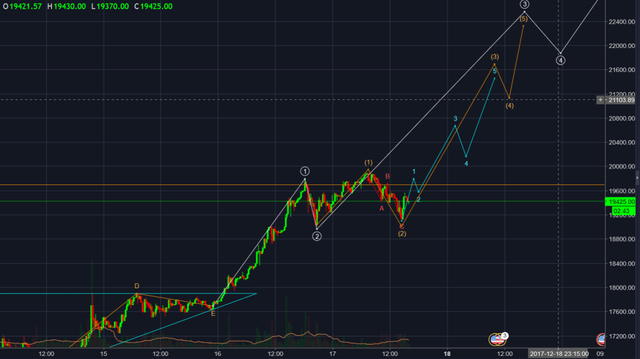 Overnight price action for Bitcoin (BTC) shows that purple wave 1 is most likely in and so an a,b,c retracement must occur. The below chart shows the modified labels. 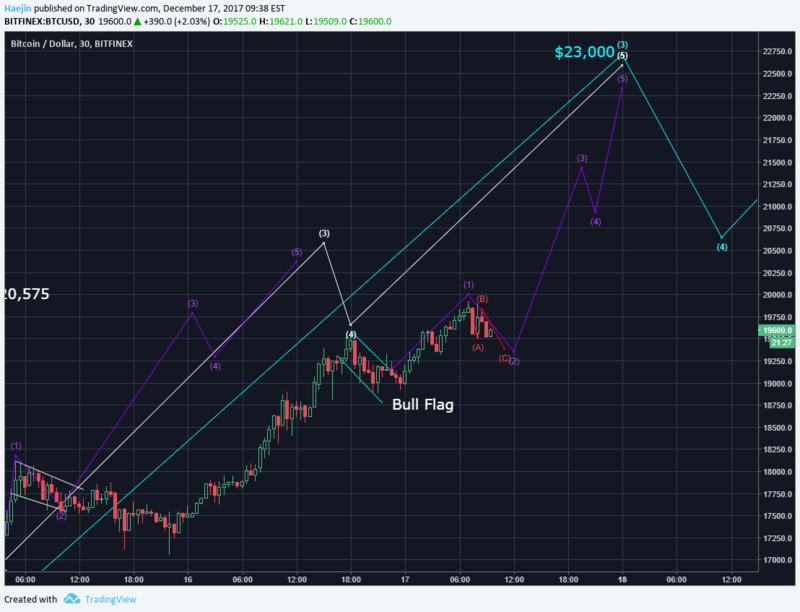 The $23k target remains and once the purple wave 3 is initiated, we should see very aggressive up moves since wave 3s are always full vigor. In the video, I also discuss how Plato's allegory of the cave has uncanny similarity to Technical Analysts who co-mingle news, events and fundamentals with price analysis. The reason why they are not able to depart away from their old ways of habits and beliefs is rooted in the meaning of the Allegory of the cave. To get full details, please see the video! @haejin thank you for your service! I NEVER saw anyone post 10 times a day and every post be so valuable! I just wrote a post i think you MAY find interesting. its a story about discovering the meaning of life whilst trading Crypto! Might be right up your street! Yep still on path to 23,000 I think too. 4:15 pm EST. Trying my hand at the count using the Coinbase chart. Hi Haejin, Thanks again. Why did you not count subwaves of wave 1 this time? Are we not currently on subwave 4 of purple 1? Maybe I'm missing subwave 1? thanks- Wish you the best. How do we incorporate the fact that new waves impulses up that make a higher high? Is this usually like the subwave 3 or 5 after a 'normal' correction.. I also have to study degrees of correction. Nice work and allegory Haejin, thanks! LOVE YOUR WORK HAEJIN! Thank you for all the wisdom you offer to us! 그래도 @haejin님 덕분에 동굴 밖의 모습을 어깨너머로 가끔씩은 보게 되네요! The rise comes as the Chicago Mercantile Exchange is poised to become the second exchange to offer Bitcoin futures. These will allow new institutional investors to speculate on the value of digital currency. At the same time, the network seems to be a victim of its success. After having passed the 120,000 mark, the number of transactions waiting to be confirmed by minors was still very high, as were the costs associated with them. 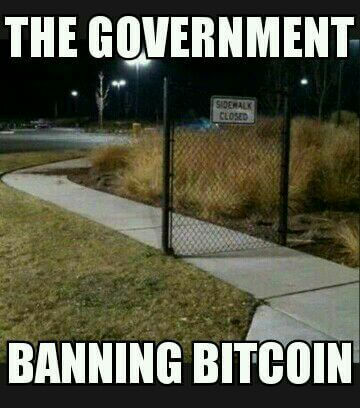 Figures that make it difficult to use Bitcoin for daily transactions, and that slow down its democratization. But an answer to these problems could be made next year, with the arrival of the Lightning Network. This will be able to move transactions "outside the chain", to unclog the Bitcoin network. Could you please do an update for Vertcoin ? Hello everyone, please excuse the fact I have posted a similar message a few times, but I am hoping to get the word out and see what happens: I would like to introduce Haejin's Sandbox. I believe it is time for the community of Haejin’s followers to have a venue to practice their charting, to ask questions of others more experienced than them, and to receive feedback on their ideas. The purpose of the blog is for followers of @Haejin (or anyone else of course) to post their charts in the comment section, and ask any questions related to those charts. I hope that the community’s collective knowledge will serve to help everyone become better at this craft. The blog is NOT intended to serve as a collection of requests to Haejin. Please note: I have used Haejin's name only with the utmost respect, but I have not requested permission to do so. If anyone who has direct contact with Haejin (e.g. @scarlet7 or @solisrex), informs me that Haejin would not like me to do so, please let me know and I will of course come up with something new. Not speaking for @haejin. However, if someone tried to increase their reputation by using my name without even asking me permission -- I'm fairly certain I would not be appreciative. A for motivation; F for implementation. Another great post haejin thanks. 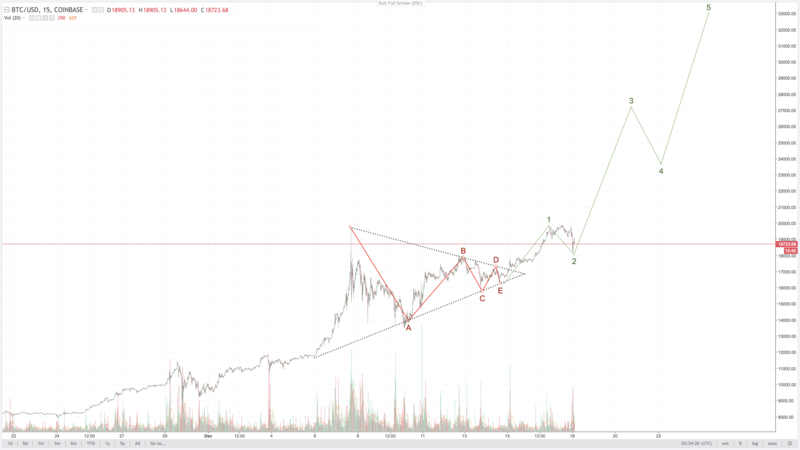 What you think about Dalin Andersons analysis and projection that we are going to $25,000 a small dip, then to $30,000 by Dec 25th or so? see his chart here. 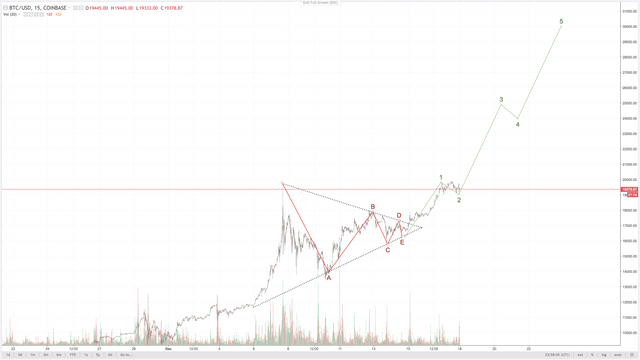 https://www.tradingview.com/chart/BTCUSD/xXj5iCUg-30-000-is-the-next-stop-for-Bitcoin/ He has been spot on many times. That'd be nice.. I want to know if btc is currently setting up for a larger than normal correction.. With potential double top .. just spotted? thanks as always for your precise and mature approach sensei...upvoted!! Thank you ! I'm gonna sleep ! 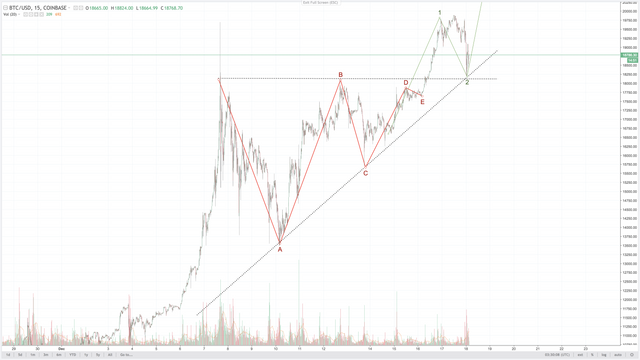 have a good day and seeya` your evening BTC analysis. it really helps me. not just because you guide how much the cryptocurrency goes up, but because you guide how to read the market, chart. that may strengthen my vision of future. therefore, I can predict somehow better than before more and more. I will keep learn with you, your videos. Kindly do the morning and evening update for SBD as well. @haejin thanks for this great update - especially love how you teach us about life as well. Building on the allegory, I would be interested in your thoughts on money in general - how did you remove the emotion from it and any day to day habits you would find useful for the community here! Really enjoy your posts, I got the EW book! Trying to learn more about corrections as I get lost pretty easily. Another very good lesson of life, not just TA. Thanks @heajin for your time. I was wondering what my further strategie should look like. Yet I'm about 40% in BTC and the rest is spread among almost 30 alts and I'm thinking to losen the grip on BTC after 23k$, any thoughts? In another words think outside the box. Man, you are the Nostradamus of cryptocurrencies! Hail Haejin! Thanks for you help, i look forward to your future content. keep up the good work, you are more inspirational than you might realize. Thanks for the update. Upvoted and Resteemed.. This is massive, massive news!!! what does everyone think about buying in on the ICO? 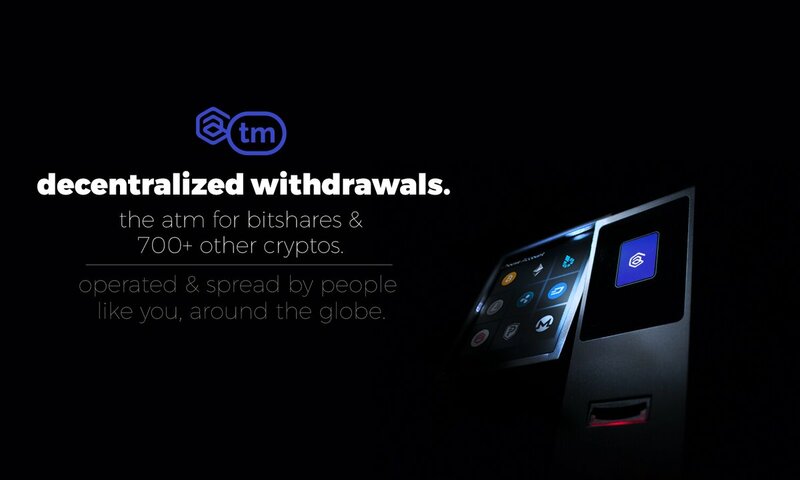 It will be my second ico, after EOS. Can you please do a update fro Etherium please.